1. 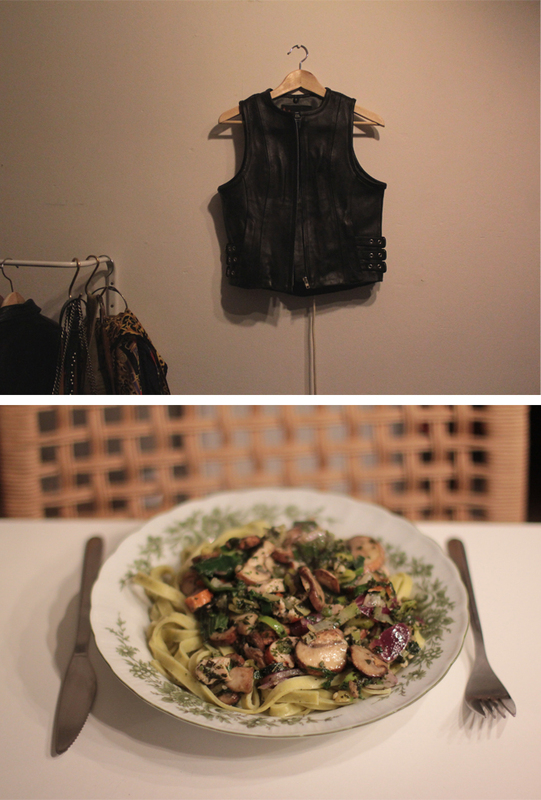 My new leather vest which I already showed you yesterday. 2. Tagliatelle with pesto and mushroom vegetable mix. 3. Today's food, (self sliced) baked potatoes with spinach and a grilled filet. 4. It's winter, time to decorate my house. Still in doubt if we'll going to buy a Christmas tree this year. 5. Recently purchased items. From left to right. 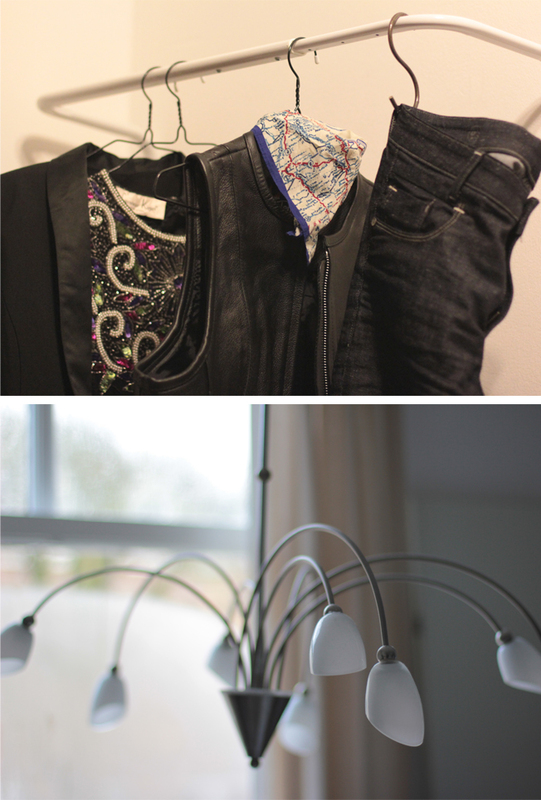 Black blazer with satin lapels from Madness, a sequinned thrifted dress which I definitely will wear at Christmas Eve, my new leather vest with a Scotch & Soda map covered scarf and last but certainly not least a slim fitted deep indigo dyed denim, the New Radar from Gstar. 6. Our design ceiling lamp, which we are going to replace with two large aluminium industrial lamps. 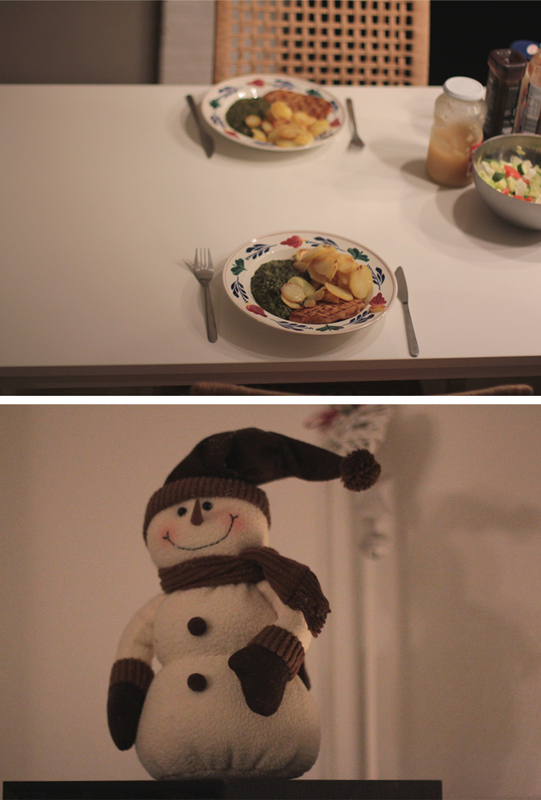 Love your new vest and the dish in the second picture looks so yummy!! 1. So the leather vest looks amazing, it is just... May I steal it? 2. The food is/looks like it is to die for. I would grab it from my computer screen and eat if I could. Shame I can't. 3. Same goes for the picture below that picture. 4. The snowman is so cute, gahhh. We still need to decorate here, yeah. 6. That is legit cool. Like really cool. Wow. That leather vest is beautiful, I'm quite jealous!